With Finding Dory currently the biggest animated film of the year in the UK, we’ve teamed up with DK to giveaway this lovely Disney Pixar Finding Dory Essential Collection book! 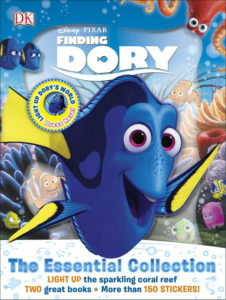 The Finding Dory Essential Collection takes you beneath the surface of the sequel to the smash-hit Disney·Pixar movie Finding Nemo. A beautiful slipcase houses the Finding Dory Essential Guide and the Finding Dory Ultimate Sticker Book. Find out about all the exciting new Finding Dory characters as well as favourite Finding Nemo characters including Marlin, Nemo and, of course, Dory, plus new favourites like Destiny, Hank and Bailey. Explore key locations, themes, and iconic moments from the Finding Dory movie in DK’s lively and informative non-fiction style. With more than 150 stickers, this is a must-have for every fan of Finding Dory. For a chance to win just enter the giveaway via our competition app below! The competition ends at 23:59 on 26 September 2016. The prize consists of a Disney Pixar Finding Dory Essential Collection book by DK.